Witters had the most liked content! I was told to put this one in the fx loop, works ok, but I’ll look into options, thanks. i was looking into some for our harmonica player and they go between the power amp and speaker as you say. Hmmmm....got me thinking. Two gigs this weekend...We’re on tour, yay! 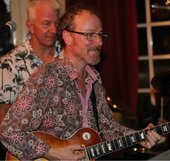 The Phil Prowse (Too) Blues Band. Saturday Wotton Blues Festival, 5:45pm, Royal Oak Sunday Beaufort Hunt, Chipping Sodbury, 6-9pm. Four piece, no drums. It’s an interesting gig. Never understood Sunday evening gigs, still the landlord likes us a lot. I suspect it’ll be calmer than the Blues Fest! I made a simple but effective (and fairly obvious now I know) discovery this week. My Blues Deluxe sounds great with a cheap attenuator in the fx loop. I can crank the preamp (had it up to 75% of full volume), get a great tone, keep the volume down. I do miss the moving air and sense of power, though. Vintage and Rare in Bath....without my wallet! Very friendly and knowledgeable staff. Their luthier/repair man is pretty damn good. Guitar Village is nice, good range, nicely laid out, some nice old stuff that they are rather protective about. I have a penchant for old stuff so although places like PMT are fantastic to see what’s around and to dream that one day I might be able to play a seven string fan fret beast, give me an old guitar anyday, therefore Vintage and Rare Bath and much of Denmark Street in London get my vote. Shop around, play lots of different ones, find a good and cheap luthier (ask in Vintage and second hand shops) as a good setup makes a huge difference but I would never pay what some shops ask. Or you could learn to do it yourself. I like Epiphone but with your budget I’d go secondhand. Good luck! I had an eighties Fender Twin. Great sound, weighed a ton. Now I have a Fender Blues Deluxe, still heavy but sounds great especially when paired with an attenuator and a good guitar! 😁😁😁😁😍😍😍 I also have a sixties Gibson GA100, all original. Also sounds amazing with an original fifties P90 equipped ES5 or a Les Paul (any age, but a good one) not so good with a strat. I have a Line6 POD XT Live. Great for recording, doesn’t work for me live. An original ‘57 Black Beauty and an original ‘54 strat.....and a ‘62 cherry es345 or 355 with bigsby and varitone, time, and....oh my glass is empty...more wine serving wench! Serving wench? Bugger, that’s me. Back in a jiffy! My 1991 ES175, neck break courtesy of my son. Bless him, he still apologises about it to this day, even though the accident was ten years ago and I’ve forgiven him. I think that’s what he finds hard. I didn’t get cross about it, said “Accidents happen, it’s ok” and got it repaired. It’s as old as he is. 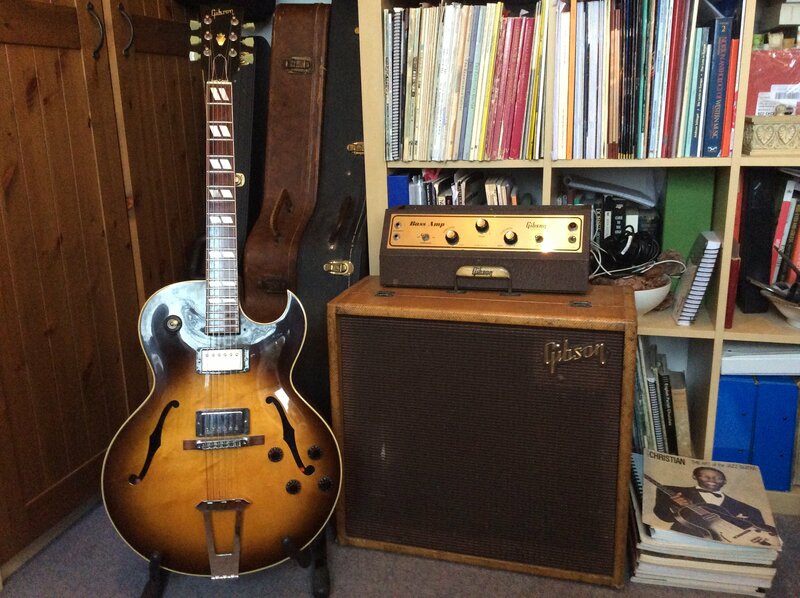 The amp is an early sixties Gibson GA100, all original. Amazing sound when cranked and paired with some P90 equipped beastie. Then there’s the custom shop tele (custom artwork on the scratchplate) and a Squier JV strat with ...50s spec Tonerider pickups, CTS pots, switchcraft jack, 5 way selector, full cloth wire, an original 1950s Astron Hymet wax/paper capacitor, on a custom shop mint green pick guard, strung with flat wounds - sounds and plays fab at a fraction of the cost of an original. I use the Fenders with the funk band and my Gibson R9 Les Paul with the swing blues band. I’d like to use the 175 as well but often find I don’t have enough space on stage! Main amp - Fender Blues Deluxe That studio of Octatonic’s is SO much tidier than my music room! Ok, I’ll add mine to the pot of already great players mentioned.... Steve Howe ... up to and including Close To the Edge. Huge influence on my attitude toward the guitar. Narciso Yepes ... he started the whole thing for me. Guthrie Govan ... especially with Steven Wilson. “Hand cannot erase” is such a great album. Has anyone seen the video of the solo from “Regret #9 (I think that’s the one). One take and the look of relief on his face when he finishes! Brad Paisley, Danny Gatton, Shawn Lane, George Benson, Wes Montgomery, Charlie Christian, Django Reinhardt, Oscar Aleman, George Barnes, Mike Stern, B.B. King, Al Di Meola, and so many more! Xuefei Yang, Kazuhito Yamashita from the classical world, although Pavel Steidl, David Russell and Paul Galbraith are ridiculous. PG is sublime. His style of playing (holds it like a cello), his touch and musicianship are out of this world. Acoustic guitarists ... not so knowledgeable here! The players I know have been mentioned. We are fortunate enough to have so many to choose from and be humbled by.